The swimming pool of the neighborhood Kibitzenau in Strasbourg, which was first opened in 1965, has an Olympic pool with 8 lanes. 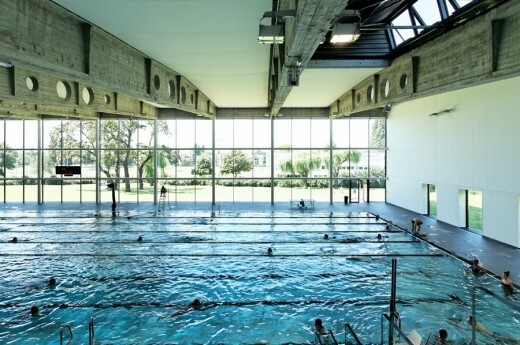 Besides its function as a public swimming pool, it is used by the professional swimmers of the Alsace region and the local water polo team. 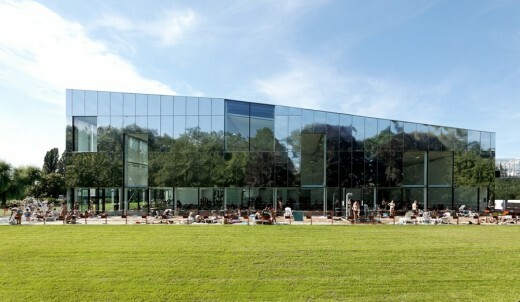 As part of the renovation, the pool was covered with stainless steel, the access to the swimming pool and the hall transferred and the offices and public areas reorganized. Generous glazing in the entrance hall and the access to the stands, offer a stunning view to the pool and the large outside areas with a lawn for sunbathing. The new entrance hall situated in the northeast allows an easy access to the locker rooms for individuals and groups. From the first floor the event area, the stands, the cafeteria, the offices and the gym can be reached easily. A patio, designed like a garden, provides natural light for the indoor areas of the first floor. The changing facilities benefit from natural lighting thanks to the six sky domes integrated in the court. The new entrance is accessible from the road via a direct path that connects the visitors to the nearby tramway. A bicycle parking is located very close to the entrance, the car parking is situated in the north. In addition, 10 parking spaces are provided for staff in the delivery area on the opposite side. The original concrete structure has been revealed during the renovation and is highlighted by the colors and materials used in the building for renovation. Black tiles, glass, white textile fabric on walls and ceilings, the stainless steel basin and polished black asphalt in public areas emphasize the structure. 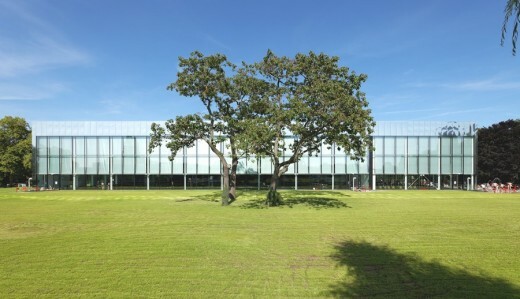 The existing building has been extended on the south facade to include a family area with paddling and training pool. The south facade opens onto a spacious wooden terrace, while the west facade is entirely glazed to underline the visual continuity with the main hall. 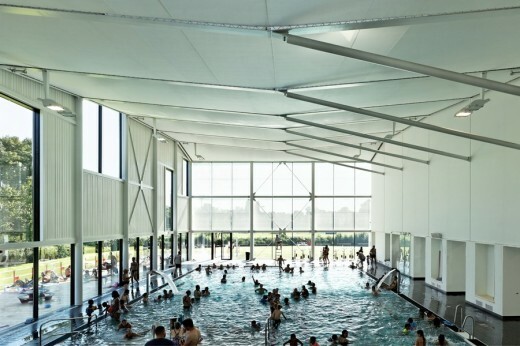 The Olympic pool area and family area are connected by openings in the load-bearing dividing wall and allow an overview of the whole pool area. The two spheres can be separated by sliding glass doors. The height of the ceiling varies between 8 and 11.50 meters. The hall opens onto the main façade located west and the lawn. The roof was renewed and equipped with three additional openings in form of sheds for exposure and ventilation. 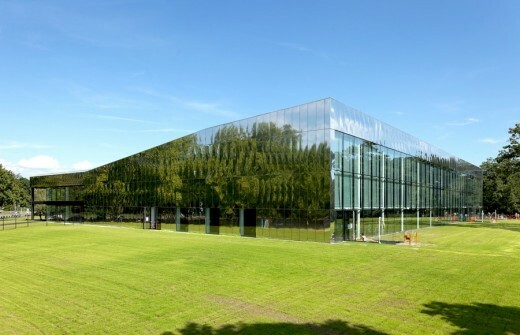 The facades are mainly transparent. The opaque areas are covered with polished large-sized stainless steel panels – 135 x 450cm – that reflect the rich vegetation of the area. A white fabric is stretched on walls and ceiling, improving significantly the acoustics. Where the skylights are located the textile is replaced by a light translucent net, guaranteeing the continuity of the surface. 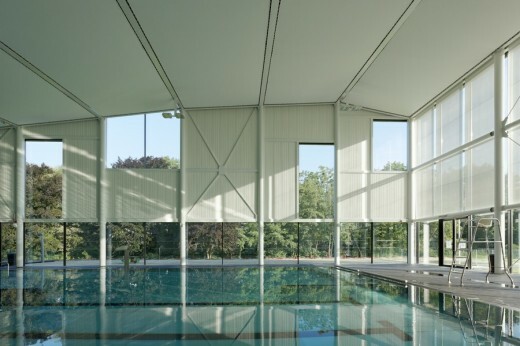 The Olympic pool with a size of 50 x 20m and a variable depth of 205 cm to 120 cm can be divided by a wall that is integrated in the basin floor. This inflatable and walkable wall allows the separation of the big basin in order to use it for water polo and as 25m pool. The area for water ball can be closed with a vertical textile network. The shallow water area can be used for activities such as Aqua Bike. The teaching pool is divided in order to correspond to the different age groups. Pool games and a slide for children are integrated into the basin. The building is bright and spacious. 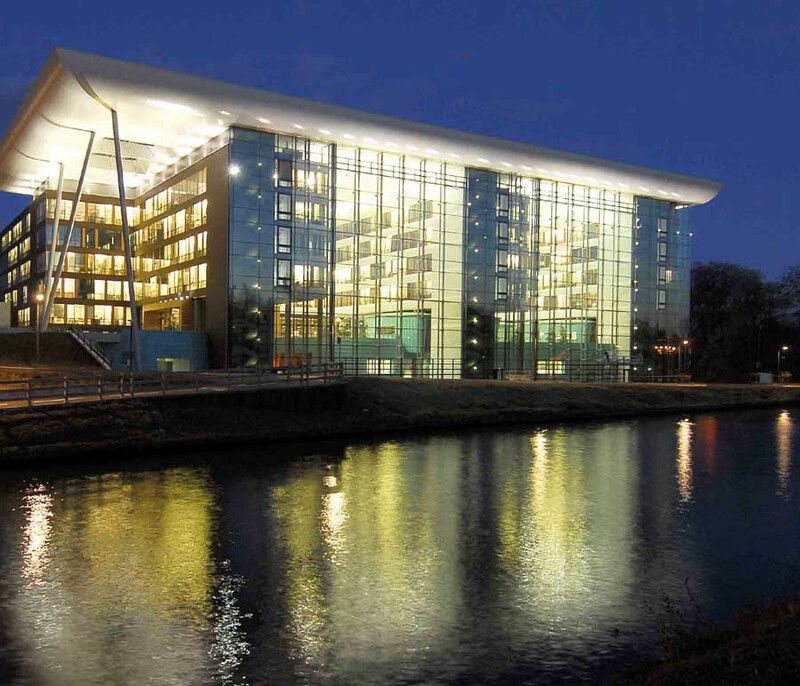 The large facades provide natural lighting and create a contact with the natural environment. The site is bordered by a river whose vegetation forms a natural filter to the neighboring houses. The indoor spaces are characterized by transversal open connections. 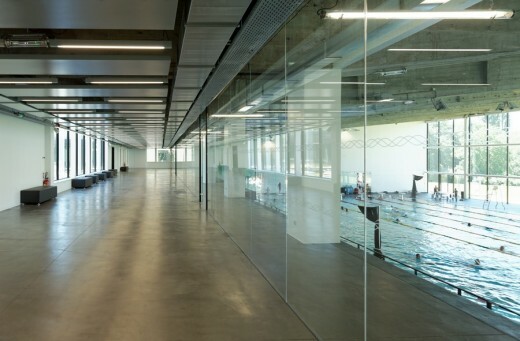 Indoor glazing provides a view on the swimming pool from the waiting areas in the hall and on the 1st floor. The stands are accessible from the foyer. A glass wall separates the event area on the 1st floor from the stands. They can be assigned to the pool or public use. All installations concerning ventilation, water and heating and structural elements are exposed. 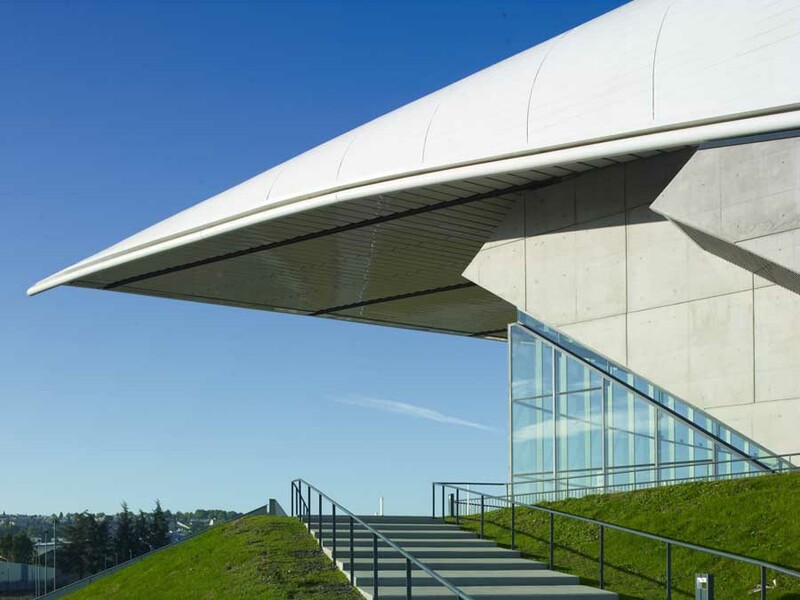 They structure visibly surfaces and provide optimal indoor climate. Another advantage is the easy accessibility for maintenance. Sound absorbing acoustic panels are mounted on the underside of the ceiling. The size of the outdoor sunbathing area is 13,000 m². Volleyball courts will be provided in the north. The family area, dedicated especially to families with young children, is situated in the south near the shallow water pool. The water in the small pool is treated with ozone replacing the chlorine. The basement is entirely dedicated to engineering and building services that have been completely redone. Here are situated the changing facilities, offices and workshop for the technical staff.